DOUG EDWARDS: CBS World News brings you another in this series by Columbia News analysts. Tonight from London, Edward R. Murrow. EDWARD R. MURROW: This is London. Five o'clock in the morning. People do a great deal of walking in London these days, but much of mine is done at night. Moonlit nights are best. There's less danger of walking into lampposts or stumbling over the curb. The weather stains on old buildings of gray Portland stone look like familiar, friendly faces. The city is absolutely quiet, like a ghost town in Nevada. At dawn—that'll be about an hour from now—the mist goes floating upward from the water in Regent's Park, and the feet of the milkman's horse sound soft and muffled on the old wooden paving blocks. Occasionally the cart will lurch, and the milk bottles rattle, as one wheel dropped into a hole burnt by one of last winter's incendiary bombs. But it's pleasant walking in London, even when the night is black. The streetlights give off just a tiny pinpoint of light, enough so you can steer a course between them right down the middle of the street. The nice part about walking in the dark is of course that you can't see anything. There's nothing to distract you. You just plod along between those little beacons. It's like being up in the bow of a ship that's (?) on a dark night. Occasionally you hear footsteps, and sometimes you may exchange a "good evening" to another unseen pedestrian. Sometimes you can imagine, or at least think you can, just what people are like from the sounds made by their feet. There'll be a young officer on leave and his girl walking home at two in the morning. There'll be the uneven cadence from the feet of a man whose had one too many drinks. The reluctant footsteps from a bus conductor on his way to work. You can't see them, but you know who they are—or think you do. For example, just a block from this studio there's a policeman. I've never seen him, but he's there when I walk home every night. Sometimes we speak; sometimes we don't. Last night I heard him shift his weight from one foot to the other as I walked past. Sometimes he's traveling in my direction, and we cruise along for a block or two together. He has big feet, and his shoes squeak. I think I'd recognize that squeak in Cairo or Chicago. Without ever having seen him I know he's a big, friendly, stable sort of person; the kind of London cop who can disperse a crowd by merely saying, "Here, here. Move along now." I know, too, that he likes the dark; likes being out there all alone. He never seems to be about on bright moonlit nights. Some night maybe I'll see him in the bright moonlight, and discover that he's a short, sour-faced, reserved policeman in an ill-fitting uniform. But I don't think so. On September 28, 1953, West German Ambassador Heinz Krekeler sat down for a televised interview with Bill Downs and Edward P. Morgan. He discusses his country's recent election results and the proposed European Defence Community. FRANK KNIGHT: Good evening, this is Frank Knight. May I introduce our co-editors for this edition of the Longines Chronoscope: Edward P. Morgan and Bill Downs, both of the CBS television news staff. Our distinguished guest for this evening is Dr. Heinz Krekeler, chief of the German Diplomatic Mission to the United States. EDWARD P. MORGAN: Mr. Ambassador, we can get into the high-blown diplomatic questions soon enough. Let's try to start on a little bit more of a human level. What is the one thing, in your opinion, that is worrying the West German citizen most? Is it taxes? Is it food? Is it shelter? Is it the threat of the Russians? Or what is it, sir? HEINZ KREKELER: Well, it's very difficult to describe this in one word. I think it's several things that they are longing for: desire for peace—that peace is preserved; desire that their unhappy brothers and sisters on the other side of the Iron Curtain are getting their human dignity and their freedom back again; and then of course to have a greater stability in Europe through European integration. I think that's what is foremost in their minds. BILL DOWNS: Well, Mr. Ambassador, we are proposing that twelve German divisions be formed. Now, in the event that this plan goes through, do you think there's any chance that West Germany would do a South Korea—a Syngman Rhee—and oppose us in major policy decisions? KREKELER: I wouldn't like to compare to conditions in other countries, but I can say this. First of all, it's not the question of putting twelve German divisions into the field, but we will guard what we are asked to do as our contribution to the sharing the burden of common defense. That is what we are really ready to do—what the German people is prepared to do—though what we are asked to do and what we want to do is to have twelve divisions in a European army. Not twelve German divisions, but twelve European divisions in which Germans serve. And that's quite a difference. MORGAN: Mr. Ambassador, perhaps we can focus on that a little bit more tightly. MORGAN: If we ask you to give your own assessment as to the significance of the recent elections in which Mr. Adenauer was reelected and the so-called "splinter groups" from the right and the left—both extremes—were routed. There's been a great deal of speculation on that from the so-called experts. It would probably be valuable to get your own. KREKELER: Gladly, Mr. Morgan. In my opinion, the greatest common denominator of the election results is this. It's an acceptance of partnership by the overwhelming majority of the German people. And by this I don't mean the advantages of partnership only, but also the burdens and the duties of partnership. Being partners of the free world—and that I think is in what you can say in the boldest terms—then one issue that we are most happy about is the crushing defeat that the neo-Nazis suffered. They didn't get a single seat in our parliament, and they got not, I think, not more than half the votes even the Communists got. And the Communists didn't get a single seat either. MORGAN: You feel that there's no real danger, then, of a rise again of Nazi elements in West Germany? KREKELER: Well, I think, Mr. Morgan, after this election, all observers agree that this danger is not existent anymore. But you know that eternal vigilance is a price of liberty, and we know this. KREKELER: Yes, I know he's very well-informed, yes. MORGAN: —and he's probably got some pointed questions to ask you on that respect. DOWNS: Well, I didn't want to get into that yet, Ed, but the—I would like to know, and I didn't have the chance to find out, but you say that the German people are willing to put up twelve divisions into this European army? KREKELER: We are willing to share the burden of defense. KREKELER: That is exactly what they mean because the (?) really didn't want to put up troops again, as you knew—only in the form of sharing the burden. Everybody shares. DOWNS: How do the young men who are going to form these divisions feel about it? KREKELER: I think we can answer this question also by the election's results. We think that the young people—not very cheerfully—but accept this; to share the burden as a duty and accept it as also by their participation in the elections. MORGAN: ...And we know that the French very understandably have been frightened—more than frightened—by some German policies before, and that probably conditions their reflexes as to the European Defence Community now. They seem to be in most recent weeks a little bit more encouraged toward getting into the European Defence Community with Germany. How do you think the situation looks at this moment? KREKELER: Well, I agree with you. I think the French reaction towards our election results was pretty much similar to that in other countries; that they were also greatly encouraged by the crushing defeat of the neo-Nazis. And then, by the way, you know the European Defence Community was—is a French proposal. And we, I think, have every reason to believe that it will come into existence. DOWNS: Well, it's been said, Mr. Ambassador, that the dilemma of Germany is that it must have an army strong enough to deter the Communists, but at the same time weak enough not to frighten the French. What do you think of that? KREKELER: All I would say—I wouldn't put it in these words. I would say that when we are contributing to the European Defence Community, our contribution is fixed not by ourselves but by consent of the partners. And the other members of the NATO who are not members of the European Defence Community have a say in this respect in the planning also. So what—the size of the German contingent is not fixed by Germany, but is fixed by all the partners. MORGAN: Dr. Krekeler, obviously one of the main questions as to Germany is to whether it can be unified, and that brings up the question of Soviet policy. They seem to have relaxed a tiny bit since the June 17th uprising one way or another. What do you really think are the realistic possibilities of such a union of West and East under the circumstances? MORGAN: How can it come about? KREKELER: ...I've been always asked why I believe this is so. And one of the main reasons I am giving for this is the effect of world opinion. I think the public opinion throughout the world plays a greater role in developments in the world as we all estimate or think, and after the events which you mentioned following the 17th of June when the population of the Soviet-occupied zone rose against their oppressors with bare hands against tanks, everybody in the world knows how these people feel. They made this uprising under the slogan of free elections. And I at the very day, the 18th of June, happened to be in Honolulu. That's pretty far away from Berlin. It's nearly half around the world—well actually is—and I can tell you I was very deeply moved by the reaction people even there at this great distance had to this. DOWNS: But Mr. Ambassador, does this not also mean that the Soviet government realizes the feeling against the Communist regimes or the Iron Curtain, and does that not also mean that their grasp will tighten rather than loosen? KREKELER: No, in the long run I don't think so. I don't think so. DOWNS: Well, supposing that in, from now til spring for example, there is no hope offered to those people behind the Iron Curtain, the East Germans; that there is no Four Power conference; there is no progress towards unification. Do you think there's any possibility of an uprising again? KREKELER: Well, of course you can say this. But what I should like to point out is that we are constantly giving them proof how we are (?) that we are standing at their side. First, there was this program of giving food passes. And now as you have learned, President Eisenhower, answering a letter by Chancellor Adenauer, said that the American people would be, by the private organizations, prepared to give clothing to those also. And by these people know that we are at their side; that we haven't forgotten them. And this is much more a human problem than a political one. Much more. I think this has a great effect. MORGAN: Do you think that's realistic? KREKELER: Oh yes, very much so. There is quite a story behind this. The first time such a plan was mentioned—when I remember correctly by President Eisenhower in his address before American newspaper editors. And then a second proposal along these lines was made by Sir Winston Churchill, British Prime Minister. And then Chancellor Adenauer made a proposal to use the European Defence Community as a starting point—if the other partners agreed to it—as the starting point for a security offer including also the Soviets. And now this has been taken also up by a French spokesman, and so I think we are quite agreed on the Western side that we should work along these lines. MORGAN: Mr. Ambassador, as the last question, and I want you to answer in just a couple of words. You've been around the country a great deal. What do you think the people of America are most preoccupied with at this moment? Very briefly. KREKELER: Well, as we all are with the question how can we preserve peace, I think that is the first political problem we have to solve in our time, and I think the American people realize very well that if we all work together, especially if Europe cooperates better than in the past, we will solve this crucial problem of mankind. MORGAN: Thank you very much sir indeed. KNIGHT: The opinions that you've heard our speakers express tonight have been entirely their own. The editorial board for this edition of the Longines Chronoscope was Edward P. Morgan and Bill Downs, both of the CBS television news staff. Our distinguished guest was Dr. Heinz Krekeler, chief of the German diplomatic mission to the United States. 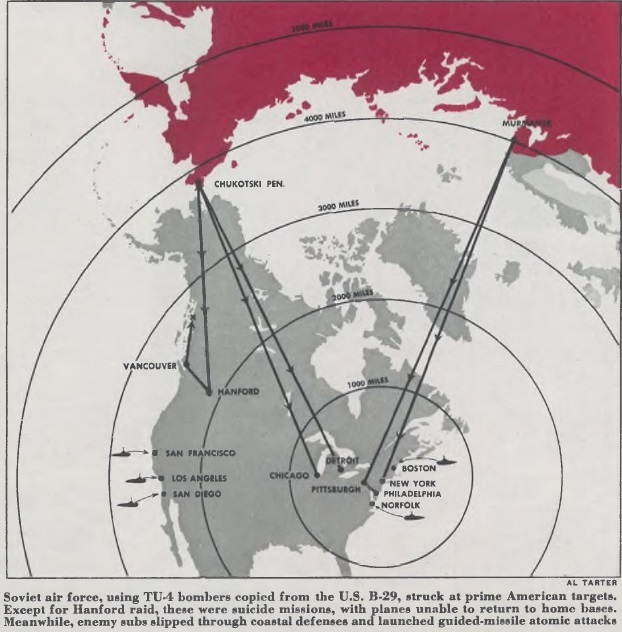 In 1951, Collier's magazine speculated about a hypothetical World War III and what it might look like. 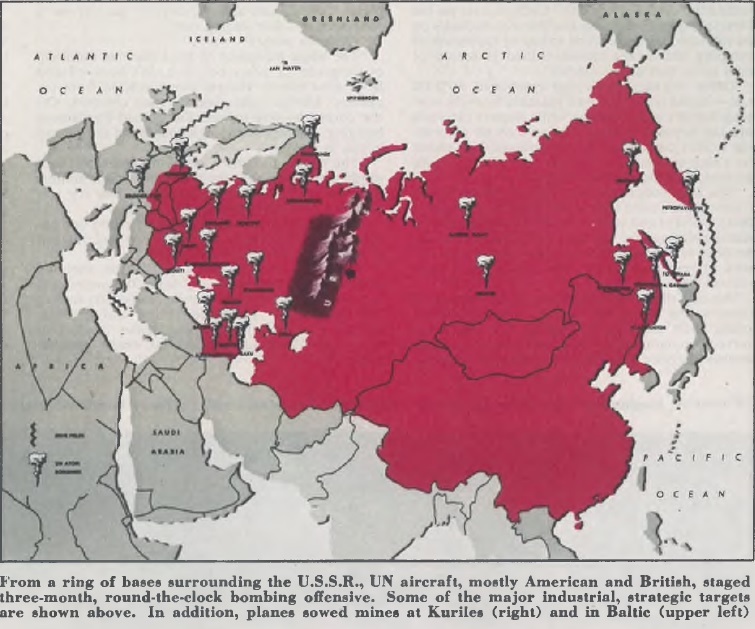 The war, as told by the magazine, begins in 1952 and ends with the collapse of the Soviet Union in 1955, followed by a UN occupation of Russia. A number of notable figures contributed fictional articles about the war and its history. War correspondent and New York Times military editor Hanson W. Baldwin wrote a summary of the military history of this war, which included the use of atomic bombs by both sides. The definitive history of the Great War with the Soviet Union cannot, even now, in 1960, be written; an army of historians will require many decades to collate, sort and interpret the voluminous records of the twentieth century's third, and largest, World War. Some important details will, indeed, be forever lost. The exact fate, for instance, of many of the men in "Task Force Victory" which air-landed in the heart of the Urals in 1953 in a heroic suicide attack against the Communist A-bomb storage depots is still veiled in mystery; the complete picture of the operation died with the leaders of the mission. But the general outline of the war and the strategic concepts that governed it are long since clear. The United States and its Allies, including the overwhelming majority of the United Nations, due in large part to the strength and political and military wisdom of their leaders, chose deliberately to fight a limited war for limited objectives. Public opinion forced some deviations from this policy; sometimes—as in the bombing of Moscow—restraint was abandoned, but the fate of Napoleon and of Hitler and the lost peace of World War II were persuasive arguments for caution. The atomic bomb was used extensively by both sides but our war was primarily against Communism and the Soviet rulers rather than the Russian people, and the unlimited atomic holocaust did not occur. The Balkans once again were the tinderbox of war. The satellite-Soviet attacks upon Yugoslavia in the spring of 1952 were the preface to far greater battles. Red Army hordes drove westward in their principal offensive across the north German plain, assisted by secondary drives from Czechoslovakia and the Balkans toward south Germany and the French frontier, Trieste, Italy, Greece and Turkey. Communist airborne and ground troops moved toward the Persian Gulf, and in northern Europe, Red Army troops, despite strong guerrilla opposition, took over Finland, and other enemy forces in combined land-sea operations moved into extreme northern and southern Norway. In the Far East, our occupation forces in Korea were forced out of Pusan under a hail of bombs, and the puppet "Japanese People's Army"—composed of thoroughly indoctrinated Japanese prisoners who had been held since World War II—backed by Red forces, ferried La Perouse Strait and invaded Hokkaido, northernmost of the Japanese Islands. Soviet submarines quickly appeared off our coasts and magnetic, pressure and acoustic mines sank many tons of shipping and closed some of our Eastern ports—until emergency countermeasures, woefully inadequate at the war's beginning, could be hastily devised. The first year of war was a tragic period of defeat and retreat. Yet the fledgling "NATO" (North Atlantic Treaty Organization) forces did better than anticipated in stemming the tide of aggression; in the Far East, the "Junipers" (Japanese National Police Reserve, established by General MacArthur in 1950), quickly provided the framework for a strong Japanese army. The U.S.S.R. suffered heavily under attack by A-bombs and conventional bombs, and some of her A-bomb works, many of the bases for her long-range air forces, and transportation and oil targets were destroyed or badly damaged. Yet the enemy was able to A-bomb London and other Allied targets, and atomic bombs dropped on our atomic energy plant at Hanford, Washington, and on Chicago, Philadelphia, Detroit, New York and Washington, D.C. 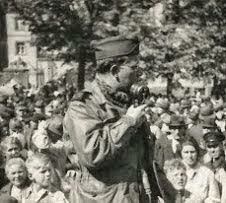 Despite our defeats and heavy losses in this first phase of the war, our strategic objective was accomplished. The Allies managed: to contain the enemy attack; to hold absolutely vital air bases in Eurasia, North Africa and the Middle East; to halt the enemy in western Europe and northern Japan; to stopper up many of the Soviet submarines by extensive aerial mine laying of the narrow seas and by carrier-based A-bomb attacks on submarine pens and base facilities; and to hurt severely the Reds' offensive capabilities and warmaking potential by exacting high casualties on the surface and by heavy attacks upon the "heartland" from the air. The second phase of the Great War with the Soviet Union lasted for about 15 months, and could be termed the "defensive-offensive" phase. During this phase we had achieved clear-cut ail superiority; new weapons, including the atomic artillery shell, were used at the front, and we launched our first "holding offensives" and limited operations to cut down enemy strength and to improve our positions for the decisive offensive still to come. Soviet strength—and the strength of her satellites—was being reduced steadily by our strategic air campaign and by the reckless tactics of the Communist commanders, who hurled assault after assault against our forces in Europe only to have them repulsed with frightful slaughter. Despite our defensive victories on the ground and the reduction of the Soviet submarine and mine menace at sea, vital enemy targets within. The U.S.S.R. proved to be so well dispersed, hidden or protected as to escape destruction. After a second series of enemy atomic attacks against the United States (included among the targets was Washington, D.C.), "Task Force Victory" carried out its desperate but successful assault against the enemy's underground Ural A-bomb pens. The third and final phase of the war—the period of great Allied offensives and decisive victories—was tailored to the concept of peripheral attacks against the "heartland" by land, air and sea (utilizing to the full the transport capacity and mobility of air and sea power) and heavy bombing attacks against the enemy's interior. No deep land penetration of Russia was ever attempted—or indeed, ever seriously contemplated—though there was early in 1954 a sizable group (chiefly among the older Army generals) that favored it. 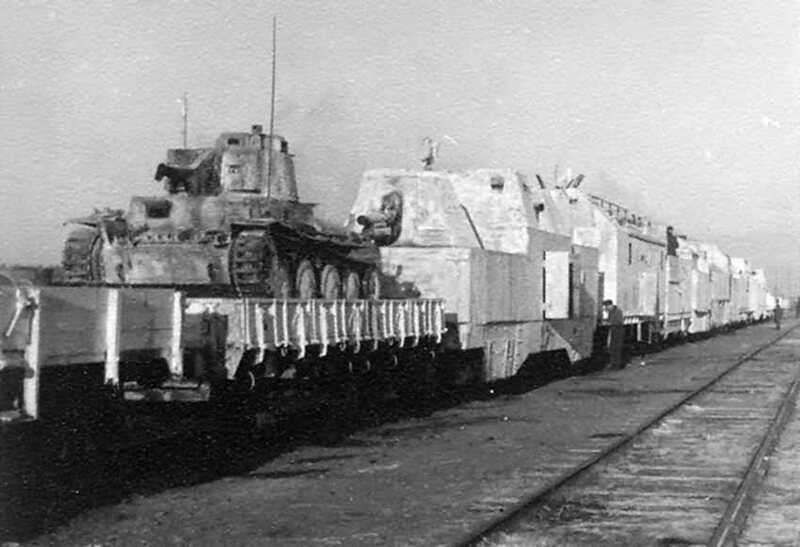 In Europe, the Baltic, the Mediterranean and Black Seas were used not only as flank protection for overland drives through the satellite states to the old Russian frontiers, but as highways across which amphibious "hops" aided the land operations. In the north, Allied armies moved through east Germany and Poland, halting their main drive at the Pripet Marshes with the disorganized remnants of what was once the powerful 8th Guards Army fleeing before them. Spearheads moved by sea and air into the Baltic States and Finland, and advanced air bases were established which dominated all of western Russia. A similar southern drive through the Mediterranean, Turkey and the Black Sea (with secondary land drives to clean up the Balkans) ended in a lodgment in the Crimea, where the last formal battles of the Great War were fought. In the meantime, as the Red Armies fell apart in the West, Siberia and Red China—their communications with European Russia cut in a thousand places—descended into chaos. Limited amphibious operations, many of them made against little opposition, put U.S. and Allied troops ashore in Korea, Manchuria and China, and from these points we controlled land and sea communications of the Orient. To World War III—the Great Soviet War—there was no formal end; indeed, there could not have been, under our concepts of strategy. For our basic aim of separating the rulers from the ruled, of encouraging the dissident and downtrodden minorities of Russia to revolt, of "fissioning" the Red Army (psychologically as well as in battle), of freeing the satellite peoples and aligning them on our side against their oppressor had, with the aid of overwhelming military force, succeeded. 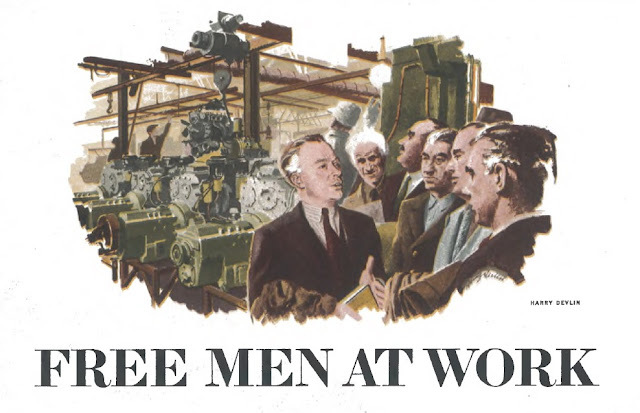 Walter Reuther, president of the United Auto Workers and an influential labor leader, submitted a story set in 1960 about his visit to Russia after the fall of the USSR. As our train rounded a curve, the old city of Nizhni Novgorod, surrounded by its stone wall, stood high above the palisades overlooking the river where the Oka slips into the arms of the Volga. In czarist times Nizhni Novgorod had been a bustling outlet for trade in the Hanseatic League. Under the Soviet regime, Nizhni Novgorod came to be called Gorki, in keeping with the modest practice of the Politburo of renaming ancient cities after its dubious heroes. A trade-union committee from the big Gorki Aftozavod (auto plant) was waiting for us at the station. Their dress was not much different from that I had seen when, in 1933, as a member of a group of American technicians, I had arrived at Gorki to help tool the plant to make Model-A Fords. I presented my credentials and introduced the other members of the Free Trade-Union Aid Committee, of which I was the chairman. I remembered the head of the Russian committee, Dmitri Malchin, as one of the more advanced technicians with whom I had worked in 1933. He greeted us, his deep voice reflecting sorrow over the past and hope for the future, saying, "When you were here before, the fever was to build. Now it is to rebuild—not only our cities, our factories, but more important, to rebuild our lives so that once again they belong to us and not to the state." As we walked past the old hot-water tank that stood in the corner of the station, he remarked, "Three wars and three revolutions have not changed the Russian love for tchai (tea)." On our way to the plant, which was built 10 miles from Nizhni Novgorod, on the banks of the Oka River, with machines and tools purchased from American automobile manufacturers, I outlined the purpose of our mission. Our committee was one of a number of teams which had been dispatched to all parts of the new Provisional Russian Republic by the International Confederation of Free Trade-Unions, to assist in the building of free trade-unions and aid in the general work of economic rehabilitation. As president of the Automotive Division of the International Metalworkers Federation, I had been designated to head the team that was to work with the newly formed free trade-union group in the auto industry. Gorki Aftozavod was to have been the Soviet version of the Ford River Rouge plant, but it gained its distinction building tanks rather than automobiles. A near miss by an atomic bomb severely damaged the plant and measurably hastened the collapse of the Soviet military machine. Unthinkingly, I asked Malchin how the world had treated him since we had last seen each other. His face tense, he replied, "Let's not talk about the dark past. We who have managed to survive live and work for the new tomorrow. Eleven years in a Soviet slave labor camp broke my body; but, thank God, they could not break my spirit." Later I learned how it had happened. It was during the Stalin-Hitler pact. The Communist party secretary and trade-union officials were driving the workers for more and more tanks. At a meeting, a leader of the Stakhanovite movement from the central trade-union headquarters in Moscow had proposed that all workers speed up their already killing production pace and work additional overtime hours, without pay for the additional hours, as a token of esteem for Comrade Stalin, their beloved leader and defender of the working class. The party and the trade-union, both, called upon key workers to pledge themselves to outproduce their fellow workers under a system of "Socialist competition" in which each worker, under the lash of propaganda and the threat of terrorism, was driven to outwork and outsweat the other. Everything went well until they called up Dmitri Malchin. His sense of fairness and decency was in open revolt against this inhuman speed-up. He attacked the Stakhanovite movement as a vicious sweatshop system that pitted worker against worker and which inhumanly attempted to drive workers for greater production under the guise of patriotism. His speech was cut short. He arrived bruised and beaten at the Siberian labor camp to undergo "political re-education." Malchin, like millions of other Russian workers, had hoped that the Bolshevik Revolution which destroyed the tyranny of the czar would also end the exploitation of man by man. But they now learned that a new and more terrible system of tyranny and exploitation had been created—the exploitation of man by the totalitarian police state. Following his liberation at the end of the war, Malchin returned to Gorki, and the workers, remembering his courage, elected him chairman of the Auto Workers' Council of the All-Russian Democratic Labor Federation. Our committee spent the day going around the plant and discussing technical problems and new machine-tool requirements; surveying housing needs; and reviewing with the medical personnel the supplies they most needed. We wound up the afternoon by meeting with the Educational Committee of the trade-union group, who outlined their adult education program and pleaded with us for a motion picture projector and educational films on how a free democratic labor movement functions. In the evening we met with the local union executive board, plant committee and shop stewards to discuss grievance procedure; how a free trade-union participates in the determination of the speed of the assembly line; methods for working out proper wage scales by job classifications; the economics of the auto industry. We reviewed the progress which the American workers and other free trade-union groups had made in the field of pensions, hospital-medical care programs, vacation pay, overtime provisions and other collective bargaining matters. In introducing me to the meeting, Malchin said, "As the head of the Russian Automobile Trade-Union group, I have the pleasure of presenting the head of the American Automobile Workers' group. "In a sense," he said, "we are opposite numbers. But," he added quickly, "we are not on opposite sides." There was a burst of applause. This idea of no opposite sides, no opposing power blocs in the world, no inhuman dedication to the production of more and more weapons of destruction was understood by the men from the machines and assembly lines. They had got the idea of one world, of one side, of people everywhere working together to build a good life, of striving together to fashion the future in the image of peace and freedom. I assured them that there never had been opposite sides so far as the common people of the rest of the world and the people of Russia were concerned, and that they had been the first victims of the madmen of the Politburo who had brought upon the world the war that no one wanted. There was a flash of pride in their eyes when I told them that people everywhere were grateful for the wave of strikes and demonstrations by Russian workers which had helped bring the Stalin regime to its knees and the war to an end without the mass bloodletting of a full-scale land invasion. I welcomed them into the International Confederation of Free Trade-Unions and into the family of free nations. "Now with free trade-unions," he continued, "we can bargain on wages, working conditions, the speed of the assembly line; knowing that our demands can be backed up with the right to strike which free labor enjoys in other countries throughout the world." That evening's conference produced plans for International Confederation оf Free Trade-Unions assistance which are newsworthy only as part of the far greater reconstruction program in Russia now being advanced under United Nations direction. More important than its details is the spirit which pervaded both these discussions and all other forms of planning activity with which I came in contact. The Iron Curtain has been torn down—not only between the West and the people of Russia, but between the minds of men within Russia. The thirst for freedom, for self expression and self-government has been sharpened, not quenched, by the long night of denial. While the outlines of the new commonwealth now rising from the rubble of dictatorship may be long in taking final form it is already clear that the free Russia labor movement, now building a firm foundation in liberty, will be among its strongest bastions. Already, down an improvised assembly line, one can see truck bodies taking shape. Already there is talk that in five years—perhaps even three—cars for ordinary folks will be coming off the same line. Nothing is beyond belief in the encompassing miracle of freedom.